The Role of the Internist in Evaluation and Management of the Diabetic Foot. A quick look at the schedule of any internal medicine practice would reveal that patients are seen for a variety of health problems that may include a cold, the flu, cancer screenings, a blood pressure check for medication adjustment, management of an infection, or an annual physical exam. Medical providers who specialize in internal medicine handle the broad and comprehensive spectrum of illnesses that affect adults. They are recognized as experts in diagnosis and treatment of chronic illness and in health promotion and disease prevention. In no other medical condition is disease prevention more important than in diabetes. Prevention is more cost effective than treatment and provides patients with a better quality of life. Internists expertise in diabetes includes managing the most serious internal medical aspects of their diabetic patients; blood sugars, blood pressure, lipids, promoting smoking cessation and providing health education. All these activities have positive implications in preventing foot ulcers and amputations. While Internists excel in the medical management of diabetes they may shy away from managing a diabetes related complication to the foot, like an ulcer. To better understand why they may not want treat a foot ulcer many Internists site lack of training and experience for them to feel comfortable treating such a problem. That is understandable, however, since Internists often times act as a gate keeper, patients may be mandated to consult with them first. Internists may also be the most accessible medical provider or they may be the ONLY medical provider in a given geography, especially if there is no foot care specialist close by. Logically then the Internist would likely be the first medical provider to be consulted by a diabetic patient for a foot problem . Why should internists deal with diabetic foot problems? The issues of foot ulcers, infections, hospitalizations and amputations in the diabetic patient represent serious health risks and are expensive to treat. The information below illustrates the gravity of the situation as well as the opportunity for the Internist to make a difference in preventing the damaging complications of diabetes on the lower extremity. 1. Each year there are nearly one million lower extremity amputations done for diabetic patients worldwide, that’s one every 20 seconds. According to the Vascular Society of India, about 1 lakh leg amputations occur every year due to diabetes-related problems. Australia has declared a national medical emergency as 16 legs are amputated every day. Diabetes UK reports 23 legs are being amputated daily in the NHS system. 2. Nearly 40% of those diabetic patients who lose a leg will lose the other leg within 3 years. Why? Because the underlying pathology that caused the loss of the 1st leg continues to affect the patient’s remaining leg. 3. Nearly 50% of those diabetic patients who lose a leg will not survive 5 years. Why? Because the degree of the pathology affecting the vascular, neurological and immune systems has advanced to a state of being unrepairable. 4. The mortality of diabetic patients who lose a leg IS GREATER THAN all forms of cancer combined except lung and pancreatic cancers. The United States Centers for Disease Control estimates that 85% of these amputations are preceded by a foot ulcer and that up to 85% of all lower extremity amputations done for diabetic patients are preventable. The research clearly shows that by preventing a foot ulcer, the subsequent infection, hospitalization and amputation can be prevented (Figure 1). This fact provides the Internist with a powerful opportunity to play a pivotal role in preventing the harmful complications of diabetes to their patient’s feet and legs. This may be accomplished by maintaining the overall health of their diabetic patient and providing patient education. The Amputation Prevention Initiative in South India revealed the positive impact of foot care education. It revealed that intensive management and foot care education is helpful in preventing newer problems and surgery in diabetic foot disease . 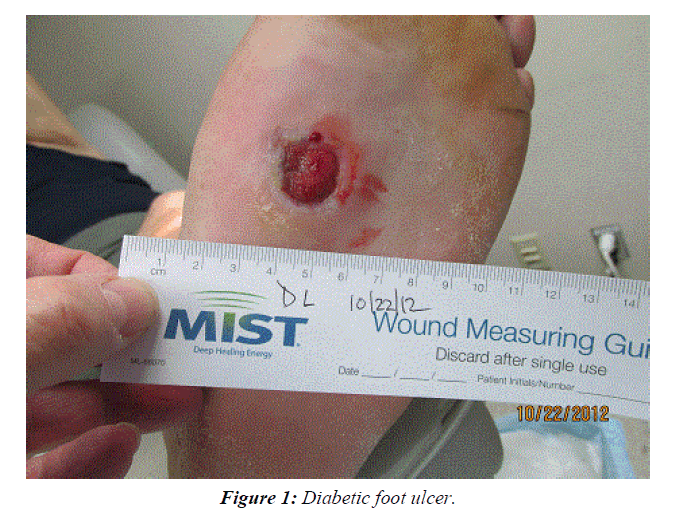 Figure 1: Diabetic foot ulcer. What can internists do to help prevent foot ulcers and amputations? 6. Perform a yearly Comprehensive Diabetic Foot Screening. How can internists help prevent foot ulcers and amputations? Foot ulcers and amputations can be prevented by Internists by doing preventive screenings. These cost-effective tests are already accepted health care protocols worldwide for identifying certain types of pathology and many are frequently recommended and performed by Internists . Most people have yearly preventative screening exams for their eyes and teeth that include x-rays/dental cleaning. Men have prostate exams, women have mammograms and pap smears. Colonoscopy is now an accepted preventive screening for colon cancer. So, adding a yearly comprehensive diabetic foot screening makes sense. Medical research has identified the mechanisms that create health problems in the feet of diabetic patients that can lead to foot ulcers, hospitalizations and amputations and result in incredibly high medical costs. Screening tools have been developed to insure every patient benefits from “best medical practices” for identifying and preventing these life changing foot problems. Internists can help their diabetic patients toward a better quality of life and better foot health by performing a yearly Comprehensive Diabetic Foot Screening Exam. The pedal complications caused by chronically elevated blood sugars are insidious. They develop slowly over time. By identifying those patients who have sensory neuropathy in advance of a complication such as foot ulcer and or peripheral vascular disease, precious resources can be appropriately focused on those patients who can benefit from prevention. The priority of the exam is to identify those patients who suffer from diabetic sensory neuropathy. This can be done via the use of the 10 gm. monofilament. This easy to perform painless screening test has been the gold standard for diagnosing diabetic sensory neuropathy for many years, however, many Internists fail to perform the exam. Diabetic sensory neuropathy causes patients to experience burning, shooting or tingling sensations in their feet and AT THE SAME TIME their feet can be numb and have lost the ability to feel pain. This situation leaves patients vulnerable to mechanical, chemical or thermal trauma, which are the triggers for developing a foot ulcer in the neuropathic foot. Screenings also identify co-morbid conditions such as bone or soft tissue deformities of the feet and vascular disease. With newer techniques that were unavailable a few short years ago, a vascular occlusion or stenosis in the leg or foot may successfully be treated via by-pass or endovascular procedures with stenting to re-establish adequate circulation and promote healing . The valuable information gained from the screening facilitates the implementation of a prevention plan that may include referral to other medical specialists or a multi-disciplinary team. Internists do play a vital role in the foot health of their patients via the management of their patient’s internal medical health (labs and patient education) and can increase the value of their care to the diabetic patient by performing a yearly Comprehensive Diabetic Foot Screening Exam that includes a monofilament exam. While the foot problems that are identified in screening are vital to a diabetic patient’s current foot health, the long-term value of diabetic foot screening is that it prevents the development of worse and more expensive problems such as ulcers, infections, and amputations and controls the cost of healthcare. Arthur E Helfand. Assessing Diabetic Foot Problems in the Older Patient. OAJ Gerontol & Geriatric Med. 2017;2(1):1-9. Andrew J.M. Boulton. Comprehensive Foot Exam and Risk Assessment ADA DiabetesCare. Diabetes Care. 2008;31(8):1679-85.